These terms and conditions apply to the use of the shop.jangneus.com, images.jangneus.com, jangneus.com websites and to any person(s) or entities that wish to conduct business with Jangneus. By using this website or placing an order with Jangneus you are accepting these terms and conditions and our website disclaimer. Please note that these terms and conditions can change at any time, and it is your responsibility to check these terms and conditions before ordering. Should you have any queries about the terms and conditions please contact us before ordering or using the website. The websites; shop.jangneus.com, images.jangneus.com and jangneus.com are owned and operated by Jangneus. Once your order has been placed and verified you will receive an automated e-mail acknowledging receipt of payment from PayPal and an email for us containing a summary for your order. All orders are subject to acceptance and product availability. Should there be any problems with your order we will contact you as soon as possible to allow you to either cancel your order or to make changes. Once your order has been confirmed, changes may be possible but may incur delays. Once your order has been dispatched we will notify you by email. We do accept orders by post and payment by cheque. If you prefer to pay by personal cheque, please post it to us with a note of what you are ordering and the delivery address. Goods will not be dispatched until the cheque has cleared. You warrant that all information you provide us for the purpose of ordering and purchasing goods are accurate, true and complete in all aspects. We use PayPal as our payment service provider for online purchases. You do not need an account to pay on PayPal and you can choose to checkout as a guest. We cannot accept payment over the phone. All prices quoted on our website are in UK Pound Sterling and include Value Added Tax at the current rate where applicable. Delivery is free for orders shipped to a UK address. Please see the delivery page for international delivery prices. Delivery prices are subject to change without notice. Orders are typically dispatched within 1-2 working days. However, dispatch times may be longer during busier periods. We typically use Royal Mail for our deliveries. For UK orders, you should receive your order within 2-3 working days from the dispatch date. International orders will take longer. For all orders, we cannot be held responsible for delays caused by circumstances beyond our control in accordance with point 5.10. For international orders, you may have to pay import duties and other taxes. We will not held liable for any of these additional charges and you must meet these costs. We recommend you contact your local customs office for further information. Disposal of packing materials is your responsibility and you agree to recycle them where possible. We may use a scheduled delivery service for some orders. If there is no one to accept the order on the scheduled delivery date the goods may be returned to the courier and we reserve the right to charge you any additional charges levied by the courier and any re-delivery costs. If you change the delivery address once the goods have been dispatched to you, we reserve the right to pass on any extra charges made by our couriers for redirecting your delivery, if the carriers are able to make the change. This will delay your delivery. If the goods are lost or damaged please report this to us within two working days from the date that you receive your order. Sometimes, for reasons beyond our control we may be prevented from dispatching your order as planned. These might include things such as accidents, breakdowns, fire, flood, storm, severe weather, acts of god, war, terrorism, riot, civil commotion, malicious damage or the default of our suppliers. We are not responsible where this causes a delay or failure in delivering your goods. Time is not the essence of the contract unless expressly stated otherwise in writing by from Jangneus. This policy does not apply to goods ordered by businesses which are exempt from the Distance Selling Regulations, or goods which are exempt from the right to cancel. We want you to be 100% satisfied with your purchase so, in the unlikely event you are not, you can cancel your order at any time up to 30 days after the day of delivery. To do this, please e-mail or write to us. We advise you to use recorded delivery as we cannot be held responsible for any goods lost in transit..
We will refund all monies paid to us by you including any postage / carriage within 10 days, less any costs due under this contract. If there is a problem with the goods, please notify us by email or in writing providing details of the problem. In addition, you must provide us with a digital photograph of the problem as this saves you having to return the goods for inspection. We will deal with the matter in accordance with your legal rights. The cost of returning goods to us is your responsibility. However, on inspection we will refund your reasonable postage costs, providing that the goods are found to be faulty. If the goods are not faulty, we will return them to you, however you will be required to cover our reasonable postage costs. If an item is no longer available we will offer an alternative. However, our liability will be to replace the faulty goods only and we are unable to guarantee an exact match. In this instance, you will have the option of a refund on the item. We are unable to guarantee and exact colour match due to the nature of the products. We will not under any circumstances accept liability or be held responsible for injury, death or any damage whatsoever to persons, animals or property caused by the use of the products. 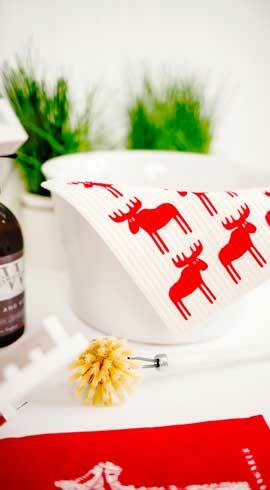 Our dishcloths should only be used on hard surfaces with the print facing upwards. If used on fabrics or upholstery please test on an inconspicuous area first. Subject to paragraph 1.2 no part of this Website may be reproduced without our prior written permission.